Does your spouse seem to act irrationally at times? Is your marriage filled with drama and conflict? Do you feel that no matter what you do, you can't seem to solve the problems in your marriage? Does your marriage seem to been on a roller coaster between states of heaven and hell? It could be that your husband or wife has a personality disorder. 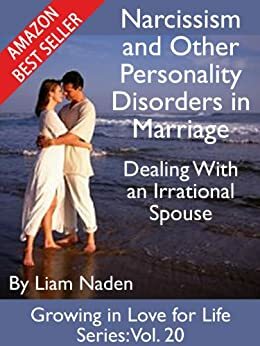 If you can't understand why you and your spouse aren't happy, you may well find the answers in this book! Great book I wish it was longer. 5.0 out of 5 starsShort but good read. 5.0 out of 5 starsWorth reading. Compact and full of the essential information. This book gives the reader honest and direct facts with possible sollutions. Liam is respected in the area of saving marriages. I'm a Christian wife; & I was hoping for more hopeful information. Even though it may be all factual, I feel even more hopeless after reading this book. However, it is good in the clinical sense; & very informative. My soon to be ex-husband has been diagnosed with borderline personality disorder. This book described his behavior to a T. It does seem he may share some narcissistic tendencies as well. It helps to realize that there's probably nothing I could have done to save my marriage. Although Lord knows I tried! And my therapist said the same thing. I was very disappointed by this book. The author is obviously not a Christian. He gave no real advice for those who are committed to their covenant. Happiness is not the ultimate goal in life. Rather, learning how to love the unlovable is the ultimate goal. 5 thumbs down for this book!